We are particularly interested in data on Kokanee. They have not spawned in Carpenter Creek for two years. Last year (Sept 2009) there were only a couple in Wilson Creek. Bonanza Creek had a much lower number, estimated to be about one half previous years numbers. 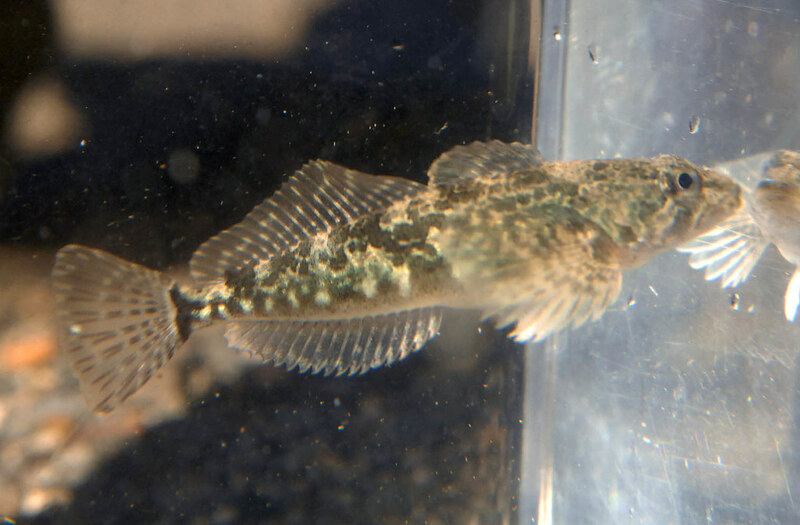 Here is a photo of a prickly sculpin (we called them bull heads as kids) caught at the north end of the lake on May 23th. They are quite common in the lake and should be spawning soon, they generally lay yellowish egg masses under larger rocks, there should be a number of different species of sculpin in Slocan and a few other species in the tributaries. Hi Richard, don’t have much to add yet but thought i would pass on some general info on rainbow trout so people can keep an eye out for them over the next few weeks…. They are spring spawners and like water temps 6 degrees C or greater to get them going. The cold spring may have delayed some creek spawning, best to get a temp to see where you’re at. They will probably be most active at night or early in the morning but some will spawn during the day. Kokanee fry will be emerging from redds constructed last fall. In mid-April Randy Spears saw trout gathering in front of Wilson Creek mouth doing ‘tail stands’. He says they rise and sink in a vertical position, like a dance, as they wait to go upstream to spawn. They wait for full moon or water temperature or whatever before they start. I have a recording thermometer in Wilson that I will be reading about mid-May. I will be posting the record of hourly temperatures for the past year on this site as soon as I have the data. I plan on continuing the temperature recording. Hi, just toured some of the creeks on the Lower Columbia (Norn’s; Blueberry; Murphy) and think the creek spawning is just starting to pick up. I expect with this warm week it should get into full swing; I also expect the Slocan tribs such as Wilson to still be a little too cool right now. Would you be able to get a spot temp of Wilson (mid-day) to check Richard? thanks. May 10/10, 1:20 PM, Wilson Creek, 50 yds upstream from lake outlet. Water temperature 7deg. C., air temperature 18 deg. C.
I will be pulling the recording thermometer from Wilson Ck. in the next week or two. It should show the hourly temperatures since last September. That will make a full year now that I have this data. Watch this website for the data and graph. Randy Spears says thay the Gerrard are spawning in Wilson Creek, several kilometers upstream from Rosebery. He watched a very large male defending the redd from other trout. I stopped at Bonanza Creek, at the outlet of Summit Lake where the highway crosses it. There were several 8 to 10 inch rainbow hanging around but none appeared to be paired nor defending. Whilst touring the West Kootenays and camping @ Rosebery on Labour Day weekend we gave Wilson Creek a look over and found ~ a hundred kokanee in full spawning colours. I had looked over the creek on the afternoon of Sept 3rd and did not notice kokanee . I went down to cast a fly that evg. at the mouth – again no kokanee were seen – however the following morning early I dropped down to fish once again and saw 3-4 “relatively” large male koks, briefly, at the mouth. Returning to the campground I went back to the creek and spent ~ hour watching over 100 smaller kokanee in the creek. Most were males, ~ 2 or 3 :1 ratio of males to females. Curiosity about the lake led me to your website – hopefully you’ll get a miracle w/ a ” 2010 Fraser R sockeye run” up Wilson crk. Hi Richard, if you meet with other SLSS members I would like to pass this request on…..could they walk up kokanee spawning creeks to record (1) approx numbers; (2) locations of concentrated spawning areas; and, (3) distance upstream they were observed? Outside of a funded monitoring program, this would give us some basic information each year. Thanks for your help, Dave DeRosa. I will see what I can organize. FYI….DFO collected 12 mountain whitefish from a site near Lemon Creek last week. The samples will be used as a clean-site comparison to samples collected below Trail on the Columbia River. There has been an increase in PBDE levels (fire retardant put into many products since the 1960’s) in the Columbia Basin. The Slocan site will be used as a control for comparison. I will post results when available but could be up to a year away. Thanks David. We will keep an eye open for the results.